Poutine—a must-try Canadian specialty | Where to next? Leslie and Wayne said Poor John and I absolutely, positively HAD to try poutine, a French Canadian specialty that has been embraced by the nation. ‘Invented’ in Québec in the late 1950s, poutine (pronounced poo-teen) is a heart attack on a plate. The ingredients are hot chips (french fries), smothered in brown gravy and topped with cheese curds. You wouldn’t want to eat it every day, but every now and then I am sure it’s good for the soul even if it’s not so good for the waistline. While poutine is often considered a fast food (even served at the big-name, fast-food outlets), our production took quite a bit of time. 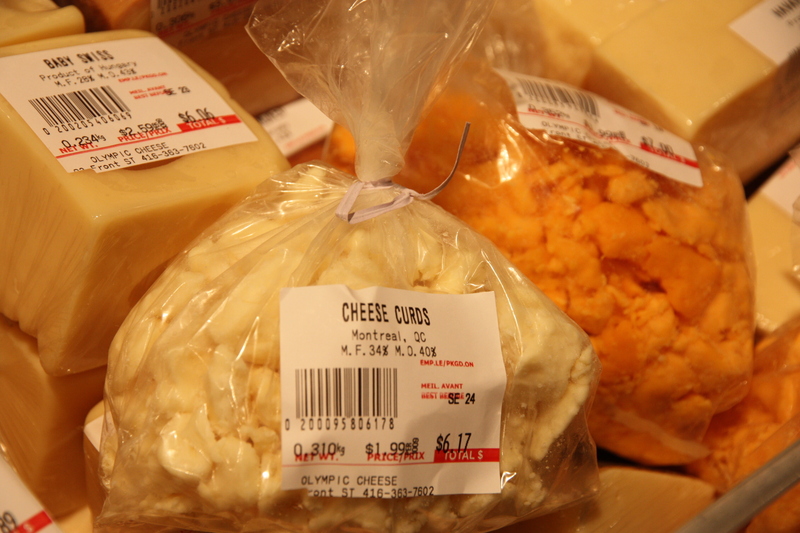 It started with a trip to Toronto for lunch with some Zaar friends (more about that soon), and on the way we swung by the St Lawrence Market where we bought two kinds of cheese curds and a slab of peameal bacon to go with the poutine. After lunch and some more touring of inner Toronto, we headed home and in search of a roadside chip wagon. They had already closed so Wayne and Poor John popped into a restaurant and bought five (yes five) servings of french fries. Once home, Wayne was in charge of assembly. First he spread the chips across two trays. 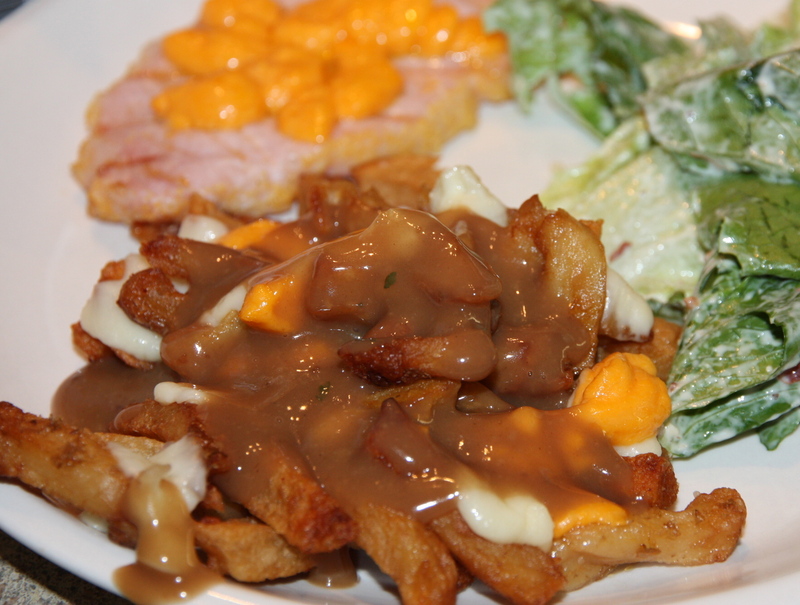 Then he sliced the peameal bacon (which had been brined and rolled in cornmeal) and covered the chips in cheese curds. Next he fried the bacon and made some chicken gravy (with a bit of light beef gravy mixed in) to top the chips and curds. The poutine was finally popped in the oven for the cheese to melt and—voila—dinner was ready. The gravy was added at the table. The combination was different and delicious. The peameal bacon was tasty too and we topped it with more curds. I like the anecdote (can’t verify its truth) of how it was named. A Fernand Lachance of Québec claims he invented the dish in 1957. He said ‘ça va faire une maudite poutine’ (it will make a damn mess). I’m also delighted that I have experienced yet another cultural delicacy. The gents at First Alleyways, an English-loving Ex-Pat hangout in Gwangju South Korea introduced all of us to five varieties of Poutine. Very comfortable food. For those not caring about calories or fat content, it’s one of the best and happiest foods on the planet. be young and be skinny for this one though. Oh my, that’s great advice! I had no idea there are five kinds of poutine, but my waistline will keep me from trying them all. The poutine purists would insist there is only one kind of poutine and it comes from a chip wagon on the highway between Ottawa and Montreal, made ONLY with white cheddar cheese curds and hot gravy that is a combination of beef and chicken and highly seasoned (read: super salty). They’re served in a white wax lined chip box that is speckled with grease stains that have leached thru to the outside by the time you’re done. Afterwards, you have a nap on the side of the highway before continuing your journey so you don’t fall asleep at the wheel as your stomach processes the dynamic salt-grease duo. Clearly, I’m a poutine snob. Toronto market named world’s best « Where to next? Yorkshire puddings and butter tarts—oh yum! « Where to next?